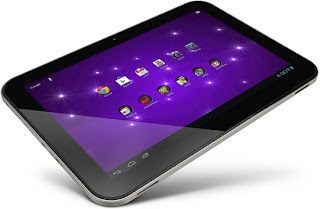 Competing with the Google Nexus 10, Toshiba has launched this year the all new Excite 10 SE. It runs on Android 4.1 OS. It is priced at $350 which is almost $50 cheaper than the Google one. This makes it more saleable. The announcement of the Excite line up was made way back in April, and now by the end of the year the launch of the jelly bean loaded slate has been made avoiding the press. Although the announcement was made on Dec 5th, it was launched just few days back on Dec 16th 2012. Its display is 10.1 inch to be precise. It has a Nvidia Tegra 3 procesor, 16 GB of storage, front ( 1.2 mega pixel )and rear facing cameras, and a micro SD slot for additional storage. It has audio and video streaming , with good stereo speakers. , which are at the bottom of the device (which could become a draw back) It runs on Android 4.1 as mentioned. It weighs only 22.6 gms and barely 0.4 inches thick. It has an intriguing brownish red color. It has the Bluetooth : 3.0, Wi Fi and USB connectivity. What it really lacks in comparison to Google nexus is the high resolution screen. Again about the pricing this is also around 50 $ cheaper than the aging iPad 2 and a 100 $ cheaper than the last excite device. Even the last Toshiba tablets launched were really good. Its just that they were so highly priced that no one really looked at them. Although it works out cheaper than the Google Nexus, it lacks the high resolution screen. So the question is would people prefer to by the Toshiba Excite over Google as it’s a lot cheapaer. Could pricing be the sole factor ? It is available for purchase from Toshiba Direct or from all retailers beginning the 6th of December 2012. 0 Respones to "TOSHIBA EXCITE 10 SE"